Glad I could help, Smits! And HOLY CRUD, PuppetGarage! You, my friend, are the BEST kind of people. Good looking out. After I got my big one, I figured it was a kinetic sand mold. 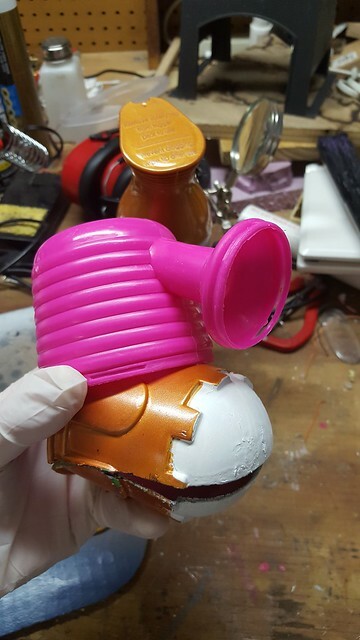 I figured I will get two, and vac-formed them for each shoulder. Puppet Garage, tell Joel that he picked a heck of a piece. I think I may have to customize the little guy's head. Parts were ordered that were the perfect shape....aaaannnnd totally the wrong size. If anyone knows where we can find an embiggening ray, that'd be kinda neat. Uh oh! What parts were too big? I've got a few different listings for the mouth part and the head part in my Amazon cart, but since its hard to guesstimate the size of those things from the photos, I may just have to try my luck and order a set. And I'm sorry, but it had to be THIS week of all weeks that my embiggening ray was on the fritz. The part I ordered for his head was too small. It's the absolute perfect shape! Iiiit's just the size of a teacup. Then of course, I had to remember that these were Basement Bots and a smaller scale originally, so I'm mentally puzzling out his head's base shape in foam instead. Mouth piece is good, and yesterday I found one single sand toys set with a shoulder piece that will work with some modding! (Hobby Lobby. THANK YOU!!) I think we're going to vac it, then mod it...? Almost betting the hands are vent dummy hands. My search history keeps getting stranger. But if I can't find 'em, I'll make 'em! "Hey! How 'bout a little sugar for Crow, huh?" I'm sure you two are having a nice hardy laugh right now. HA HA HAH! Seriously though, how can we ever thank you for all these wonderful helpful hints? It really does mean a lot to us. Anyone had any luck locating (or crafting) a shifter boot that mimics show Waverly? Smits said she has something pretty close. Plus, it apparently takes paint well! Who'da thunk it? I'm jonesing for some pictures of the build! Hey, and while I'm here, I identified/found another part!!!! Smits, I think I'm holding a head that's the right size! Stay tuned for pics/info here in a bit! Okay, so I've been hitting up practically every store I can think of in my area, trolling the "summer fun" sections looking for the parts for Waverly's head, mouth, and shoulders. Last week, I nabbed a shoulder, and today I'm pretty sure I found the correctly sized head! After getting a "nudge" to go to Target (I'm choosing to believe it was the spirit of the dearly departed Waverly urging me on. You are invited to think the same thing! ), I found a set (pictured below) that had the correct watering pot! After reading of Smits' troubles with a similar part that was too small, I was nervous about buying the set on the spot. But after referencing some photos of the Basement Bot version and Final version of Waverly, I'm pretty darn sure it's the exact one Joel used for his maquette. When scaled with my shoulder piece, it matches the pictures of the Basement Bot perfectly. The real test will come when I finally find the mouth piece and stick it in the pot, but I really think that this is the correctly sized head! The pot is 6.5 inches in both width and height. The diameter from one end of the pot's lip to the other (once the lid/handle is removed) is 4 inches. I'm in the middle of trying to whittle down a cartfull of Amazon listings to only the ones with these larger measurements, and I'll post those here when I'm done. In the meantime, if anyone out there (I'm looking at you, Smits!) wants a garunteed larger head, I'd be happy to pick up another set and send it your way! PM me and we'll work something out! I will load up pictures of smits parts and my build this weekend. The more I look at the pictures, the more I am convincing myself it is not a shifter boot. My first thought was it was a vase or flashlight of some kind, and the top down shots are making me think it is probably something like a square Tupperware pitcher. Wednesday I bought a temporary replacement airbrush so now I get to hit up the hobby store so I can shoot some Testors Go Mango, Tangerine, and Turn Signal Metallic and figure out which one is the right color. My second Waverly Eye which is not right, but I can cut the stem to length to match the one that Danzilla found. My Hobby Lobby did not have the Orange paints so I am going to two others tomorrow. Disregard the arcade stuff in the background - buggered up the wiring last weekend and am slowly fixing it. This thread is currently my absolute favorite thing in the internet. Haha, I bet it is! Fastbilly1, I'm loving your work so far! That shifter boot looks pretty amazing! I'll be interested to see how you alter the watering pot/head. I'm glad I could be of help as well! If you need any more pictures in addition to the ones above, just let me know and I'll snap a few ASAP. Okay, so I'm pretty sure I have found at least one Amazon listing that contains the accurately sized Waverly head. It's hard to judge scale on these things from photos, but it's important to know because there are, apparently, two versions of this watering pot that look nearly identical, but one is way too small. The way to tell the difference is to look at the positioning of the spout. On both pots, there are eight little ridges on the outside. On the correct pot, when held right side up, there are three ridges below the spout, and one above it. (This is, of course, reversed when the pot is turned upside down in the "Waverly head" configuration). On the incorrect pot, there are four ridges above the spout, and none below it. Both spouts cover four ridges, but only one pot is the correct size for Waverly's head. I'll attempt to track down some more listings here soon. EDIT: While I'm here, I'll post some links that feature the INCORRECT version, just so you know what to avoid. DON'T BE FOOLED! I bought the $5 incorrect set from China. 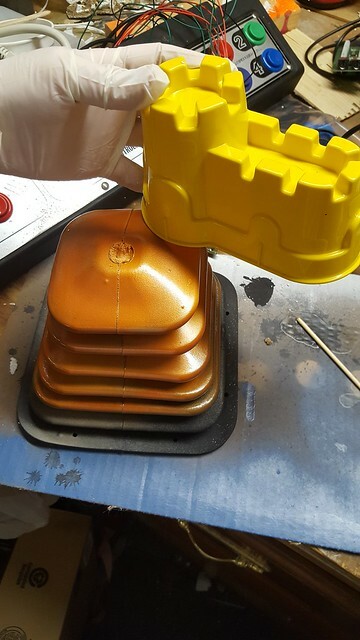 After three hobby stores I only found two containers of turn signal amber metallic. Mixed it up, loaded into my nice airbursh and gummed the sucker up. So I loaded the mix into my crappy airbrush and after a few passes it gummed up to. I checked my mix, I had grabbed flow reducer not flow enhancer.